UPDATED, March 16, 2011 — The Catholic Church announced that Lázaro Garcia would be released and take exile in Spain. 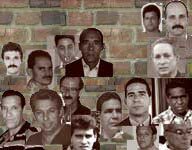 Lázaro Alejandro Garcia Farah was arrested Aug. 4, 1994, and sentenced to 25 years in prison after he and seven other people tried to hijack the boat "Baraguá" so they could escape Cuba for freedom. But in prison, Garcia, now 37, has proven himself more than a pirate, but as a prisoner of conscience on the front lines of the opposition to the dictatorship, albeit from a jail cell. No one less than Pope John Paul II stood up for Garcia, including his name on a list of political prisoners for whom he was seeking clemency during his visit to Cuba in 1998. The regime rejected the request, and when Garcia protested, he was thrown into solitary confinement. Later, from November 2000 until February 2001, Garcia was denied visitation rights, after he refused to participate in political indoctrination classes. In a telephone conversation with the Cuban Foundation for Human Rights, the prisoner declared: “Many times they serve lunch and skip snacks, drinking water is not potable is full of parasites and residues. Occasionally, they turn the water off for up to three days. Medications are given crushed, where most of the dosage stays in the bottle or is accidentally mixed with other medications”. He also added that there are prisoners that after spending two years in the maximum severity regime, their family visits continue to be restricted to one every four months and their conjugal pavilions one every five months. In regards to the political prisoners and those of conscience he stated that their rights to correspondence and that of religious assistance are constantly violated. Garcia Farah expressed a deep concern for the health of Eduardo Diaz Fleitas, a prisoner of conscience of the group of the 75.